Home ABA Journal Blawg 100 The Legal Geeks Made the ABA Journal Blawg 100! The Legal Geeks Made the ABA Journal Blawg 100! Words cannot express my joy that The Legal Geeks made the ABA Journal Blawg 100 for a second year in a row. Thank you all very much for this wonderful honor. We are deeply humbled you enjoy The Legal Geeks. The dictionary may define a “geek” as someone with “excessive enthusiasm for and some expertise about a specialized subject or activity,” but we would quibble about the word excessive. We hope that Josh Gilliland and Jessica Mederson never stop sharing their pop-culture enthusiasm with us. This year, we especially enjoyed the series of posts that coincided with the movie release of Guardians of the Galaxy. Their podcasts also should not be missed. The ABA Journal is the flagship magazine of the American Bar Association, and it is read by half of the nation’s 1.1 million lawyers every month. It covers the trends, people and finances of the legal profession from Wall Street to Main Street to Pennsylvania Avenue. ABAJournal.com features breaking legal news updated as it happens by staff reporters throughout every business day, a directory of more than 4,000 lawyer blogs, and the full contents of the magazine. I have had a lot of fun the past year using action figures, shooting video with green screens, and finding new ways to be creative. 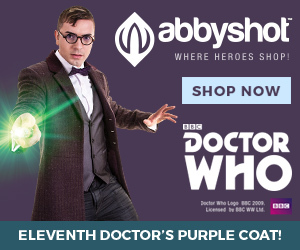 I want to thank New York State Court Judge Matthew Sciarrino for his friendship, sharing our blog, and joining us for the occasional podcast on Doctor Who or Star Wars. Judge Sciarrino introduced us to New York political consultant Gerry O’Brien, an amazing geek in his own right with his book 1901: Theodore Roosevelt, Robot Fighter. I had a blast discussing the legal and political fallout of Captain America The Winter Soldier and Agents of SHIELD with Judge Sciarrino and Gerry. Jessica and I also had our first celebrity podcast when Matt Weinhold joined us to discuss Doctor Who, after Jess qualified Matt as an expert under Federal Rule of Evidence 702. I met Matt back when my family owned Rooster T . Feathers Comedy Club while I was in college, who is a wonderful person, and geek extraordinaire. A lot of people have ReTweeted and promoted us over the past year, including the talented Madeleine Holly-Rosing, author of the Boston Metaphysical Society, San Diego Comic Fest, and our friends at The Geekie Awards. There are many others and thank you so much for your support. I want to especially thank Jessica for continuing our adventure on The Legal Geeks. Jess is an outstanding lawyer, dedicated mother, and has a wicked sense of humor. 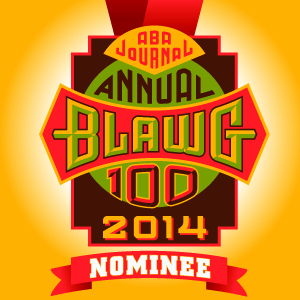 Voting is now underway in each of the 13 categories of the ABA Journal Blawg 100. We were so honored to win the For Fun category last year. We ask for your vote once again. If you could please vote for us in the For Fun category, we would greatly appreciate it. 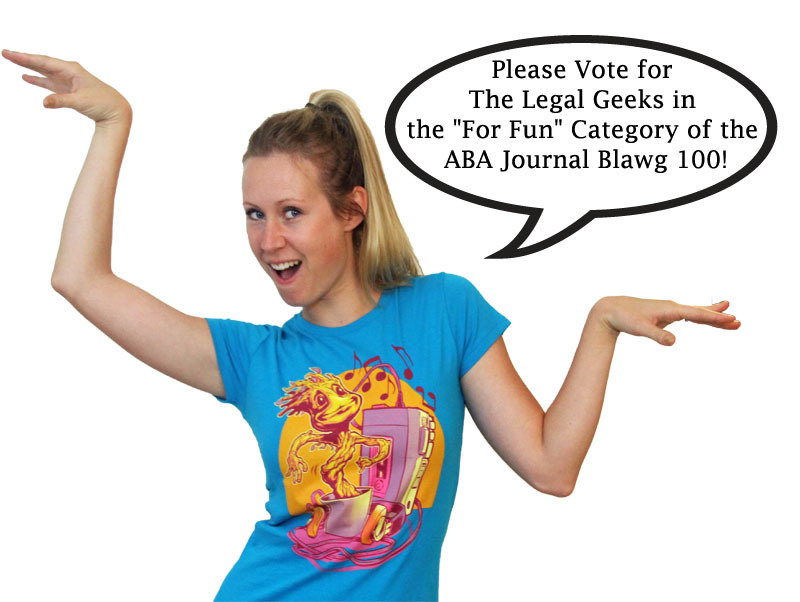 To vote, please visit the ABA Journal, register, and vote for The Legal Geeks in the For Fun category. Thank you all for reading The Legal Geeks. OK, back to dancing to I Want You Back.